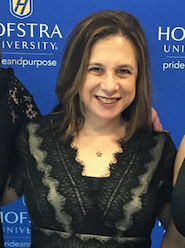 Hofstra Career Center: What is a Career Fair and Why Should I Go? What is a Career Fair and Why Should I Go? Good question, and we know some of you are thinking it. While the words “career fair” are thrown around in our office with great frequency, we realize that students may not truly know what a career fair is. So, consider this Career Fair 101 regarding our Fall Career and Internship Fair, happening on Wednesday October 17th from 11-2 in the Mack Arena. A career fair is a gathering of companies that are looking to hire students for full-time, part-time or internship positions. If a company is at the fair, chances are they are actively looking to fill these roles, although they may have varying timelines. For example, some hiring needs may be immediate, while some may be for the following academic year or summer. So, no matter when you graduate, chances are you will find employers who fit your time table. Not looking for any position at the moment? Coming to a career fair is still a great idea so that you can walk around and know what to expect when you are ready to search for an internship or job. Walking into a room of over 125 employers can be intimidating, so doing a practice run is a great idea! Wear your professional best! Come in business attire. If you are not sure what that means, we can help! Is the fair only for business majors? NOPE! Employers attending the fair will be representing a wide variety of industries, including engineering, education, health care, not-for-profit, and may others! Yes, and plenty of them. It’s a good idea to have your resume looked over by The Career Center prior to the fair. Students can get a quick resume review during our Quick Question drop in hours, which are Tuesdays and Thursdays from 3:30-4:30 and Wednesdays from 11-1, no appointment necessary! Should I bring cover letters? Should I follow-up with employers? Yes, take a business card from the representatives and make notes on the back with anything relevant that they told you. Send them a thank-you email for taking their time to attend the fair, and attach your resume, even though you may have given them a hard copy at the fair. Don’t be disheartened if you do not receive a reply. 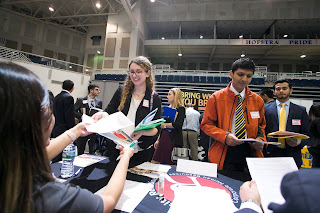 Recruiters attend many fairs and meet many students, but taking the time to follow-up with them shows your interest. Have any more questions? We are here to help! 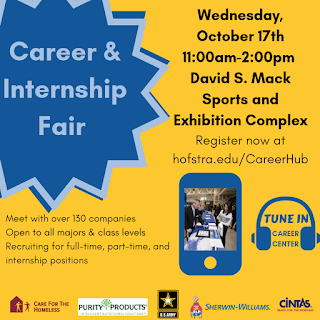 Give us a call at 516-463-6060 or email us at careercenter@hofstra.edu. See you at the fair!